"Roswell, New Mexico" premieres Jan. 15, 2019, on The CW television network. 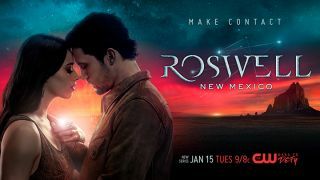 The new television series "Roswell, New Mexico" premieres tonight (Jan. 15) with a bold new take on a show that first aired 20 years ago. The new show is based on the "Roswell High" book series written by Melinda Metz from 1998 to 2002; that series was the springboard for a previous television series, "Roswell," broadcast starting in 1999 on The WB network. "Roswell, New Mexico" airs its first episode on The CW, the successor to The WB. "One of the important things I wanted to do was return Liz Parker back to Liz Ortecho, and create a show with a Latino lead and a really diverse cast," executive producer Carina Adly MacKenzie said at a panel event in October 2018. "I wanted to make sure there was a reason to reboot it … I wanted to make sure that it felt very grounded in 2018." The show begins with human Liz Ortecho returning to her hometown, Roswell, to live with her father. As she comes up against the racist and xenophobic environment in her community, she resumes a relationship with her high school sweetheart Max Evans, who she discovers is one of the three extraterrestrials who arrived in the UFO crash landing of 1947. "Roswell, New Mexico" is filmed in Santa Fe, New Mexico, and is produced by Warner Bros. Television and CBS Television Studios in association with Amblin Television and Bender Brown Productions. The show features the talents of actors Jeanine Mason, Nathan Dean Parsons, Lily Cowles, Michael Vlamis, Michael Trevino, Tyler Blackburn, Heather Hemmens, Trevor St. John and Karan Oberoi. "Roswell, New Mexico" airs on CW at 9 p.m. EST/PST 8 p.m. CST.